So they will do well in court if they ever have any trouble! Having judges on their shareholder lists must be very advantageous and lucrative to businesses..
We should be paying more attention to how the judges slosh their money around and who exactly benefits from this..
Just think of the headlines of politicians said they were going to scrap their own registers of interest and bring in a set of ethics to hide all their corruption and bribes in the same way the judges do. Now we are beginning to see why Lord Gill fought so hard to keep this information from becoming public.Too late Brian we all must know what is going in with your pals on the bench just think of all the conflicts of interest arising from judges links to banks and people in courts day in day out taking legal action against a bank or the bank making someone homeless.It has all got to come out and be published. Doubt they will be happy you posted the entire shareholding list but it is a public document and as you say judges should declare their interests. Here's a thought to any new Lord President - get some honesty and publish all your interests. 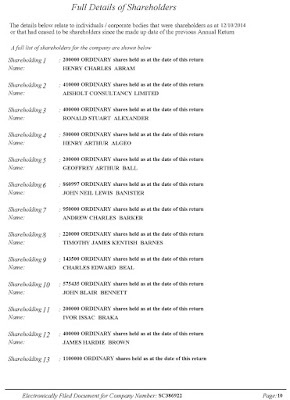 There are a lot of names on the shareholder list matching up to lawyers and others they will almost certainly have some kind of links.I saw your tweets on the story earlier in the week and already subscribed so was able to read the main article by Russell Findlay.Very thorough.More please. Bankers lawyers and judges what is the difference? NONE except maybe no judge seems to have jailed any of the bankers for ripping us all off! I now see where you are coming from on judicial interests,they are everywhere banks offshore everything and yes it ought to be declared. Conflict of interest?.....trust us say the judges (supported by the Sturgeon, McAskill and Co). If they have nothing to hide they have nothing to fear - make the register of interests law NOW! Someone stamping their ownership of Scotland right in our face - office right next to Sturgeon,sounds to me like a warning shot across the bows of Scottish independence. How about maintaining public confidence in the banking system by jailing bankers instead of cuddling up to them! Almost unthinkable, given the extent of business and family links between the judiciary, the legal profession and the banking sector. The Courts tell us that it is perfectly all right and above board for GCHQ and others to engage in the mass surveillance of the Public's previously private telephone calls, emails and internet use - BUT - they refuse point blank to engage in even the most basic level of transparency and openness themselves. More double standards (to accompany double dealing) anyone? "Almost unthinkable, given the extent of business and family links between the judiciary, the legal profession and the banking sector." Is this another of those brilliant but dodgy Scottish financial products we should keep a good eye on? 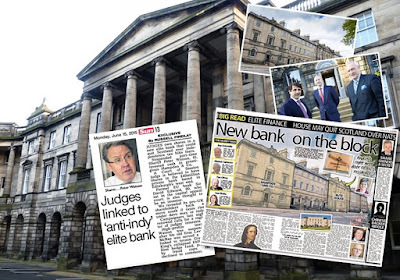 Interesting a unionist bank starts up in Scotland just a few months after the indyref wonder what they are up to? 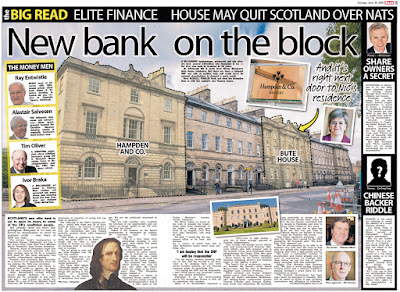 The RBS and the Bank of Scotland go down the tubes and end up being consumed by the British Tax Payer, whereupon they cannot break even, then in the vacuum up pops a new Scottish bank? Wonder where all this new money came from? A good investigation by The Sun (Scotland) and lays it on the line unlike soppy versions in the financial press who would have missed out the shareholders including the judges for obvious reasons. Your post and the newspaper's investigation makes me wonder what really goes on in the banking and legal fraternity and why some people are so eager to protect their secrets.There is nothing wrong in having private banks however it must all be out in the open especially judges and public servants if you really want to clean up what is a very rotten industry! People keep asking why no bankers are jailed well the answer is staring you all in the face because judges have shares in the same banks!